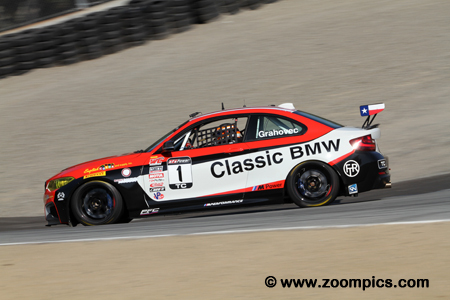 Rounds eleven and twelve of the 2017 Pirelli World Challenge Touring Car season took place at Mazda Raceway Laguna Seca. Twenty-six Touring Car drivers were scheduled to compete in the two forty-minute races around the eleven-turn 2.238-mile road course. Four competitors were vying for the 2017 Pirelli World Challenge Touring Car title. Leading the standings was Paul Holton with 183-points, in second with 175-markers was Nick Wittmer, thirteen-points behind Wittmer was Greg Liefooghe and the final contender was the 2016 champion, Toby Grahovec. 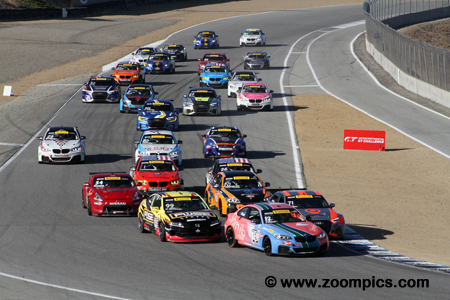 The Touring Car field heads into Mazda Raceway Laguna Seca’s turn two on the first lap of the penultimate round. Leading the way is the point’s leader and pole-sitter, Paul Holton in the Compass 360 Racing Audi RS 3 LMS Club Sport. Beside, Holton is the second fastest qualifier, Greg Liefooghe driving the Stephen Cameron Racing prepared BMW M235iR. There was a total of twenty-five drivers competing in round-eleven. 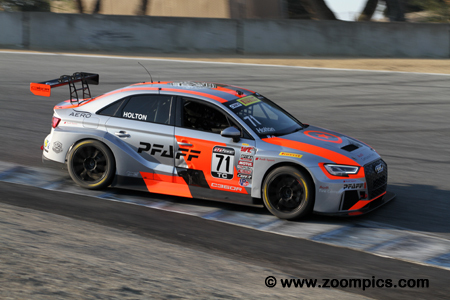 The Touring Car point’s leader, Paul Holton, entered the finale at Mazda Raceway Laguna Seca with two victories to his credit – Virginia and Canadian Tire Motorsport Park. The final two rounds could not have gone better for Holton. He qualified on the pole for Saturday’s first race and won the contest. Later in the day, the driver of the No. 71 Audi repeated his performance and captured the 2017 Touring Car title. 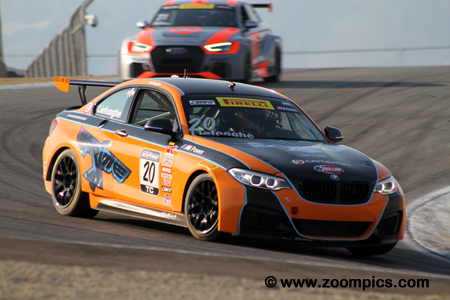 2016 Pirelli World Challenge Touring Car champion, Toby Grahovic, had a mathematical chance of securing his second consecutive title but it would be no easy task as he trailed the points leader, Paul Holton by twenty-seven markers. Grahovic lined up tenth and finished fifth in round eleven. In the final contest, he was gridded seventh and was fifth at the checkered flag. Grahovic finished fourth in the final standings. The driver with the most Touring Car wins in 2017 was Greg Liefooghe. Liefooghe won at Virginia, dominated the Utah Motorsports Campus weekend and grabbed another victory at COTA. 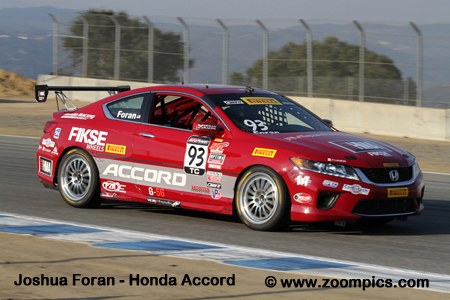 But he was no match for Paul Holton at Mazda Raceway Laguna Seca. A pair of runner-up finishes was not enough for the driver of the No. 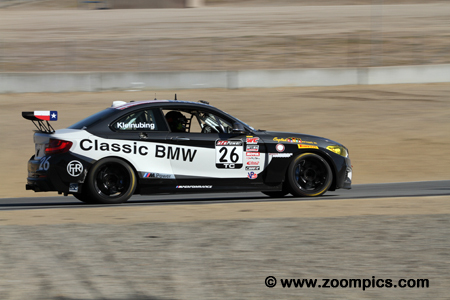 20 Stephen Cameron Racing BMW 235iR to take the title from Paul Holton – he finished second. 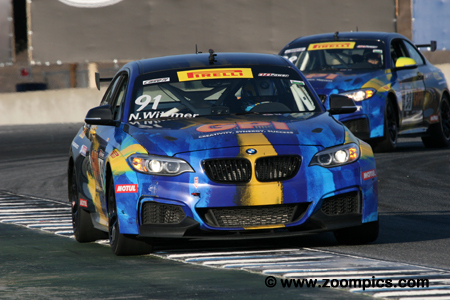 Nick Wittmer had shown a lot of speed in the ST Racing BMW M235iR. Wittmer finished first in round ten at Circuit of the Americas but he also experienced an equal amount of bad luck. Wittmer was leading at Virginia International Raceway when contact with a backmarker caused him to crash. His title hopes ended with a disqualification in the weekend’s first contest. In race two, Wittmer was sixth after starting at the rear of the grid. The start of the season finale and fourth fastest qualifier, Mason Filippi in the No. 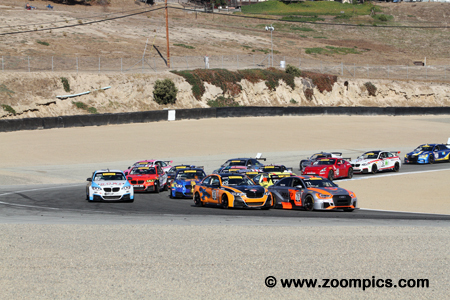 12 Winding Road Team TFB BMW M235iR surprises the front row with his excellent start. To Filippi’s left is the Audi of the pole-sitter and eventual winner, Paul Holton. And on Filippi’s right side is the second fastest qualifier, Karl Wittmer driving the Ste-Rose Racing Honda Accord. Five-time Pirelli World Challenge Touring Car champion, Pierre Kleinubing returned to the series for the final two rounds. Driving the No. 26 BMW M235iR, Kleinubing exhibited the skills that made him a multi-time champion. In round eleven, he was gridded seventh and took the last position on the podium. In the season finale, Kleinubing started slightly better in fifth and grabbed another third-place finish. 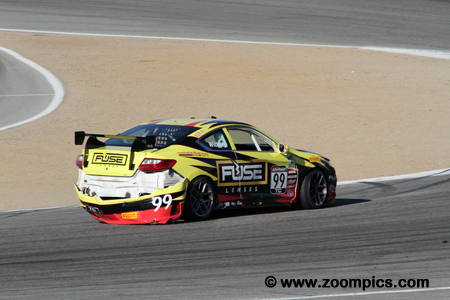 It appeared that Karl Wittmer was going to have his best results of the season at Mazda Raceway Laguna Seca. In Saturday’s first event, Wittmer qualified fifth behind his brother, Nick. Unfortunately, he retired after fourteen laps when the wheels studs failed on his Honda Accord – but not before he set the race’s second fastest lap. Starting on the front row in the finale, he was hit by Tony Rivera and had to pit causing him to drop out of contention. In round four, on a damp track at Canadian Tire Motorsport Park, Mason Filippi made the right tire choice and surprised series regulars - winning by a margin of 25.904-seconds. In the weekend’s first contest, Filippi started and finished sixth. The driver of the No. 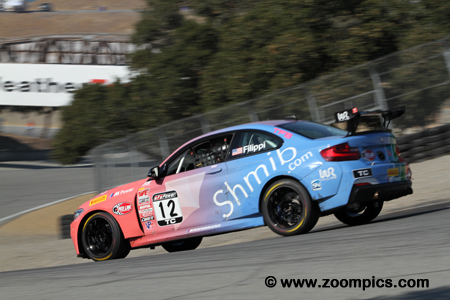 12 BMW M235iR made a specular start in round twelve – going from fourth to first by the second corner. At the checkered flag, he was fourth.